Photographs, maps, and links about some of the places where my ancestors lived. More coming, real soon now! 01 May 2006, revision 1. 04 May 2006, revision 2. 25 February 2007, revision 3. Stockport, Cheshire was where the Scanlons and Legges mixed, and was also the jumping-off point for their 1880s emigration to Rhode Island. These maps show the Stockport and Liverpool/Manchester areas in this decade. Stockport, on the Lancashire/Cheshire border, roughly 6 or 8 miles southeast of Manchester, then clearly was distinct from Manchester. This is not obvious on modern maps, which show that Manchester has sprawled and pretty much swallows it up. Malcolm Farmer has a collection of 19th century English county maps, one of which is an 1886 map of Staffordshire, Shropshire & Cheshire from the Encyclopedia Britannica; a portion of it, showing Stockport and vicinity, is reproduced here. 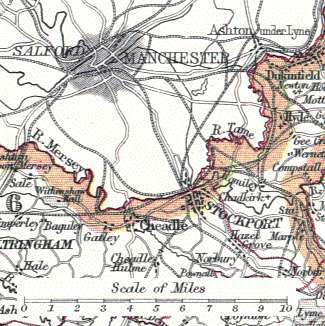 Genmaps has an 1882 map of the environs of Manchester, showing both Stockport (bottom of map) and Chadderton (top of map, just right of center). The location of Bradford, although unlabeled, is just north of Beswick (immediately above the label "MANCHESTER"). For other period maps see Rootsweb Genmaps; for current maps of England, see the Ordnance Survey Get-a-map service. Examples of Lancashire speech - the closest I could get to Stockport speech - including audio clips. 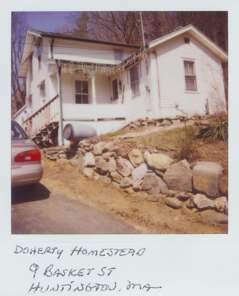 LouAnn's "Dorset GARLAND Ancestors" has photographs of the countryside and buildings of Affpuddle, Waddock, and environs. Huntington, and some of the surrounding towns, is the place my maternal lines converged. The Town of Huntington and the Huntington Police Department both have web sites. The Huntington Community Development Plan, 2003 is online. The Huntington Village Historic District (#99001080) was added to the National Register of Historic Places in 1999. St. Thomas Roman Catholic Church in Huntington has published a modern view of its building (warning - it's a page with sound); "Hidden Hills of Western Massachusetts" has another one. More information about St. Thomas Parish is at Parishesonline.com. 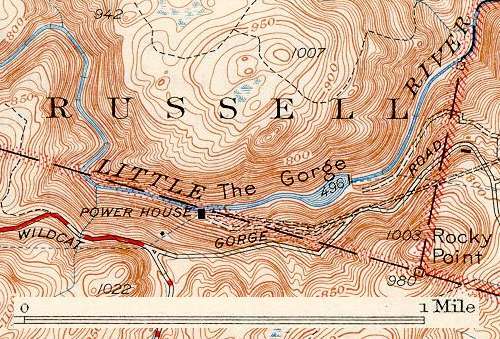 This is a fragment of the northwest corner of the USGS 1947 Southwick quadrangle, a topographical map from the University of New Hampshire's collection of "Historic USGS Maps of New England & NY". Even living at the base of Watery Hill, elevation 390 feet, the highest point in Bristol County, did not prepare me for how awesome The Gorge is. My grandfather took my brother and me for a drive there one summer evening, and it felt like we were underground, the hills were so tall and steep. I need to see it again, almost fifty years later, to find out if I've misremembered it, and to see if I can duplicate the experience of first hearing a whippoorwill. 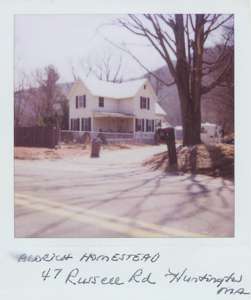 Recent photographs of Burnis Aldrich's house, 47 Russell Rd., Huntington, and Patrick Doherty's house, 9 Basket St., Huntington. This is a section of a Sanborn fire insurance map of March, 1885 (from "Digital Sanborn Maps 1867-1970" at NEHGS) showing Seth P. Carpenter's Lyceum Hall building on Main St., and some of the surrounding area. 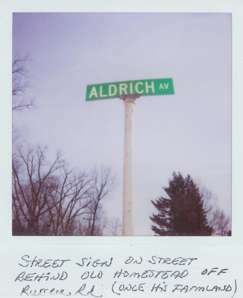 The block is bounded on the west (the left side) by Jefferson St. and on the east by Spring St. Published Thursday, 26-Apr-2007 04:01:37 EDT. Copyright ©1999-2019 Raymond W. Scanlon.